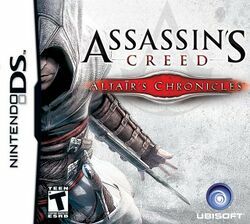 Assassin's Creed: Altaïr's Chronicles is a video game released for the Nintendo DS and Symbian Mobile. It is a prequel to the video game Assassin's Creed, and is published by Ubisoft and developed by Gameloft. It was released in the United States on February 5, 2008. It features two new cities, Tyre and Aleppo; and the three original cities, Jerusalem, Acre and Damascus; but does not include Masyaf. Unlike the original Assassin's Creed, the game is not told through the perspective of Desmond Miles, but rather the perspective of Altaïr Ibn La-Ahad, although the menu screens do take place in the Animus. A port with improved graphics and gameplay was made for iOS by Ubisoft and was released on the App Store April 23, 2009. The year is 1190 AD, and the Third Crusade is engulfing the Holy Land. Crusaders clash with Saracens for control of the Holy City, Jerusalem. A young assassin returns home from an arduous journey and is tasked by his elders to find and retrieve a sacred object: the Chalice. It is said to have the power to unite under one flag all the factions of whatever side possesses it – either the Crusaders or the Saracens – and end the Third Crusade in victory for one side or the other. But the Chalice is too powerful an object to be left in the hands of men alone: it must be found and destroyed. This page was last edited on 4 February 2011, at 21:00.